Approx Dims: 8 1/4" x 7 1/4" x 8 1/4", Cold Cast Hand Painted Resin. This dragon sculpture, designed by artist Ruth Thompson is based on her "Coppervein" piece. Her brilliant copper wings encircle her nest, the inner wings hand-painted in matte orange and yellow the outer surface of her wings are metallic copper heavily carved with her scales. Her body is covered in a combination of metallic copper, deeply burnished gold scales. Her egg she protects is a red to orange to yellow gradient, resting upon a bed of crystals and rotating through the spectrum due to the embedded LED. 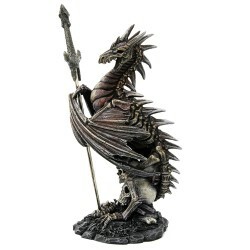 Truly a unique collectible for any dragon lover! Artist: Ruth Thompson Size: 11.75" H X 12.5" W x 5.125" D Hand Painted Resin requires 2 AA batteries for the LED. Shipping Weight of 4.2 Pounds. 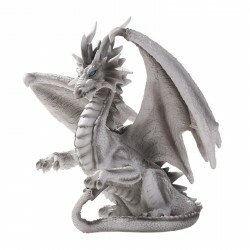 This amazing statue features the "Hoarfrost" purple dragon by artist Ruth Thompson! She has shining, detailed scales and a watchful gaze. Perched upon a rocky outcropping, she rears back with her wings and tail curled about herself, lavender crystals sparkle below. The crystals lights up thanks to an LED and rotates through the spectrum, shifting through vibrant and striking colors! Truly a unique addition to any fantasy lover's collection. Artist: Ruth Thompson Size: 18" H x 12.25" W x 6.25" D Hand Painted Resin requires 2 AA batteries for the LED. Shipping Weight of 6 pounds. 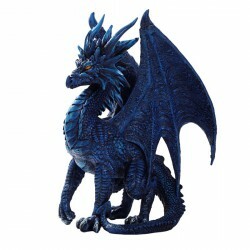 This striking statue is based upon Ruth Thompson's "Hyperion" dragon. A burnished crimson dragon perches upon a red cave, a large actual crystal nestled inside. His wings are outstretched on either side of him brushing against his highly detailed scales. The carved crystal stone underneath sparkles in shades of crimson and rotates through the spectrum with an LED. Bring this impressive beauty into your home and let his fire shine! By Ruth Thompson Size: 18.75" H x 9.5" W x 7" D Made of Hand Painted Resin requires 2 AA batteries for the LED. Shipping Weight of 7 Pounds. This fantastic figurine is based on is based on Ruth Thompson's piece "Jade". The green dragon perches upon a rocky ledge which has an elaborate celtic design carved into the face. The beast has iridescent scales, with his ears and horns laid back into a fierce snarl. The celtic design lights up via an LED with colors rotating through the spectrum, making it a truly unique piece for any collector! Artist: Ruth Thompson Size: 18.75" H x 13" W x 5.5" D Hand Painted Resin requires 2 AA batteries for the LED. Shipping Weight of 5 pounds. This gorgeous dragon is based on Ruth Thompson's piece "Morning Stretch". She is poised upon a rocky base head curled around her wings. Watchful and ever ready. At the base, blue crystals sparkle. The piece lights up with an LED rotating through the spectrum with different colors, making it extra magical! By Ruth Thompson Size: 18.75" H x 9.5" W x 7" D Made of Hand Painted Resin requires 2 AA batteries for the LED. Shipping Weight of 5 pounds. This fantastic dragon has been brought to life by artist Ruth Thompson based on her piece "Quicksilver". This brooding dragon is done in shades of black, blue, and silver while crouching upon the rocks. His mouth is agape, his eyes and horns standing up in a threatening gesture upon his head. Glittering crystals sparkle from beneath the dragon, and the azure crystal cave is lit by the LED light and rotating in color through the spectrum. A unique dragon that belongs in a fantasy loving home! Artist: Ruth Thompson Size: 12.5" H x 9" W x 6.75" D Hand Painted Resin requires 2 AA for the LED Shipping Weight of 3 Pounds.